Michelle's Handcrafting Blog: Which glass is mine? Have you ever been out at a some sort of function, such as a party and you've put your glass down for a minute and then gone back to retrieve it and then you can't remember which one was yours, as the table is full of glasses? Well I've done that quite a few times and each time I've just shrugged my shoulders and gone off and got another glass. That is both time-consuming and a waste of a drink. There is no need to do that anymore, the answer is a wine glass charm. I know some of you out there are saying, 'a wine glass what???' Wine glass charms make it easy to identify which glass is yours at a gathering. They usually have a charm, dangling from a silver ring and decorated with beautiful beads and all you do is unhook the loop and wrap it around the base of your wine glass. Each one is different, so you'll always remember, which glass is yours. I've been adding some new wine glass sets to my website. This set, can be for an engagement party. 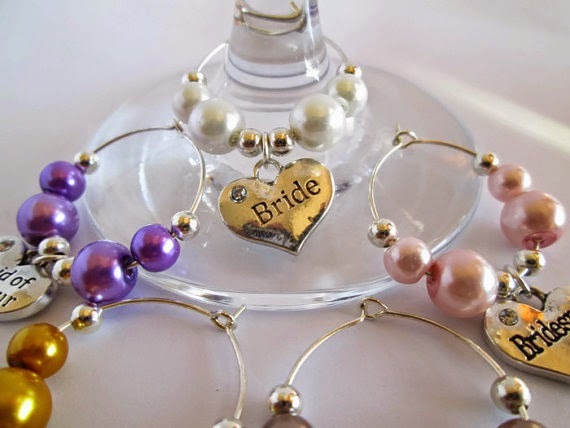 A couple of girlie themed wine glass charms, for a hen night or a girls night out. Also a couple of sets of baby themed wine glass charms, for either a christening or a baby shower. I also have a range of wedding wine glass charms, that can also be used as wedding favours, for the bride and groom and the wedding party.